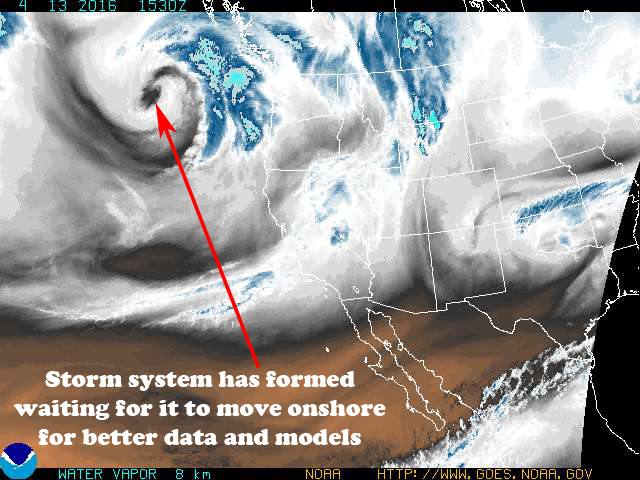 Our long range models have been bouncing the last few days but this morning we began to see some agreement. The trend with the longer range models overnight is that those showing no snow prior are beginning to come around. 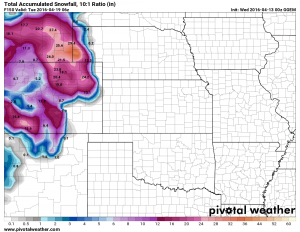 The GFS (shown at the top) showed nearly no snow at all for the lower elevations of the front range on Monday, but as we went through the day yesterday we saw this begin to change. 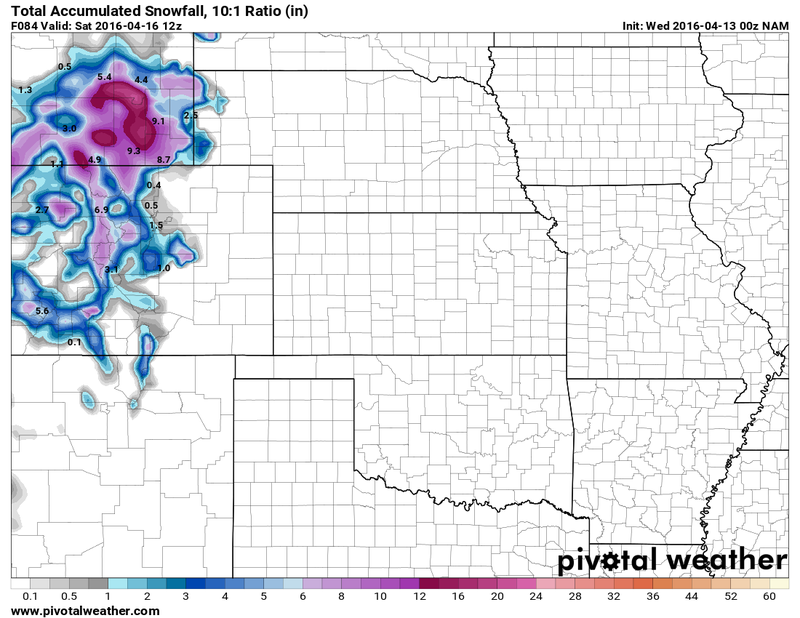 The Canadian Model, known as the GEM has shown a ton of snow throughout the period. This may be a bit overdone in my opinion, the Canadian is not a model I usually refer to much but with high uncertainty in storm systems its good to take a look at the big picture and include a bunch of models. 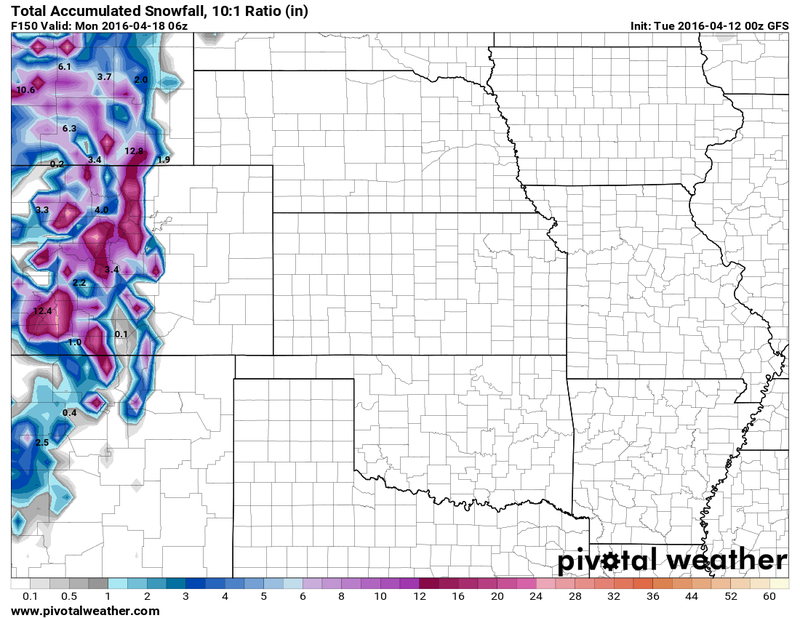 Interestingly, the mid range NAM is just beginning to come into range and runs through Saturday morning (bottom right) It shows snow accumulation by Saturday morning for many areas along the front range and especially South over the Palmer Divide. 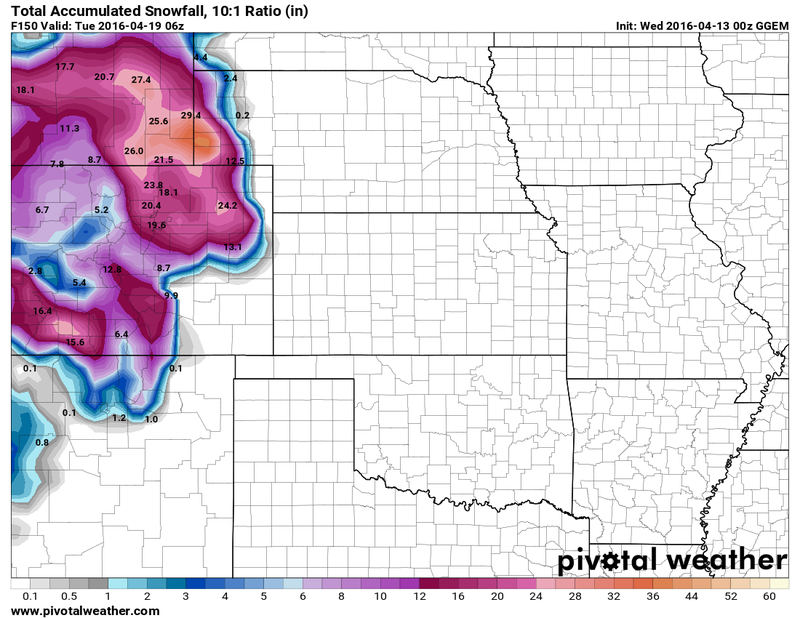 This is the big one, despite the hype that’s been going around 50 inches of snow is not going to fall on Denver! 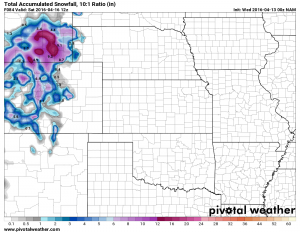 A chance of significant snow exists but nothing amounting to 40-50 inches. 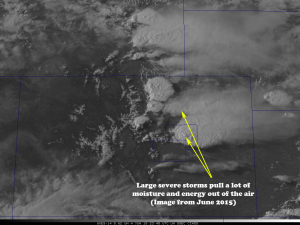 Friday is expected to be our first decent severe weather day of the year for Colorado. At this time, Denver and the surrounding areas have only a marginal (meaning very small) chance of seeing severe weather. 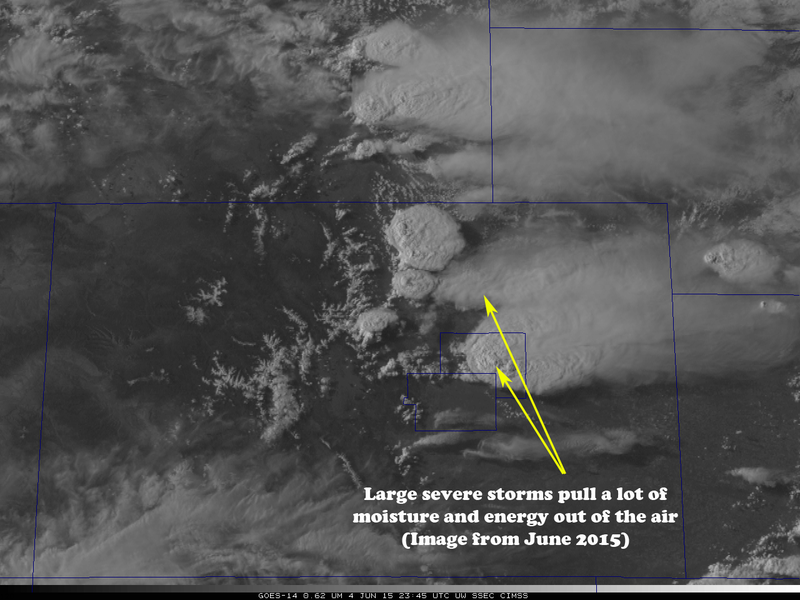 The Southeast corner of Colorado however could see bigger nastier storms. The problem here is, the bigger and more severe these storms get, the more moisture and energy they will pull out of the atmosphere. This would mean less moisture makes it along the front range of Colorado and because of that less rain or snow falls. Think of these storms like a sponge, there is only so much moisture available with this storm (there is a lot) but these storms could chew up a lot of moisture as well. The good news is the storm has formed over the Pacific and is beginning to move onshore as early as tonight. This will allow us to gather better data for models and as we get into Thursday the better data along with more mid-range models coming into play will give us a better solution. By Thursday morning, we should be able to start nailing down some of the finer details with this storm assuming more uncertainty doesn’t get introduced. At this point, stay tuned as we will pass along any forecast changes and start thinking about the possibility of preparing for a large storm this weekend. Whether rain or snow, we will be in for a prolonged period of unsettled weather.